BONN, Germany – “One small step for man, one giant leap for mankind.” Finally, after several years of formal negotiation processes, a decision on how the agriculture sector can tackle climate change issues has been finally reached at the 23rd Conference of Parties (COP23) of the United Nations Framework Convention on Climate Change (UNFCCC), which was held in November 2017 in Bonn, Germany. The decision was based on the position submitted by the G77 & China Group of countries, which would not have been made possible without the ASEAN Common Position in Agriculture. The Common Position draws upon the common priorities for agriculture identified by the ASEAN member states in their respective Intended Nationally Determined Contributions. 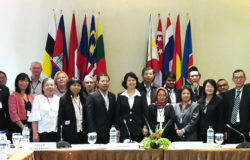 The development of the Common Positions was facilitated by the ASEAN Climate Resilience Network (ASEAN-CRN) – with support from the German Federal Ministry for Economic Cooperation and Development (BMZ) through the Deutsche Gesellschaft für Internationale Zusammenarbeit (GIZ) GmbH – as a priority activity of the network to assist ASEAN in engaging with the UNFCCC processes for the first time in order to gain support from the international community in scaling up Climate Smart Agriculture practices in the region. 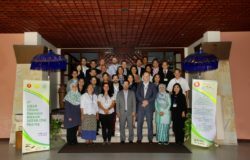 The Food and Agriculture Organization of the United Nations (FAO) Regional Asia Pacific Office and the CGIAR Research Program on Climate Change (CCAFS) also provided support and technical inputs to the Common Positions. Two submissions at the 44th session of the Subsidiary Body for Scientific and Technological Advice (SBSTA44) in May 2016 were made by Vietnam, on behalf of ASEAN member states, on adaptation measures in the agriculture sector and practices and technologies to sustainably enhance productivity. These two positions are based on the ASEAN Regional Guidelines on Promoting Climate Smart Agriculture Practices, previously endorsed by the 37th ASEAN Ministers on Agriculture and Forestry (AMAF) in September 2015. ASEAN, through the Common Positions, raised for the first time the profile of the agriculture sector in the region by engaging in COP22 in November 2016. The Common Positions found its entry point in the official meetings of COP22 through the group of G77 & China. 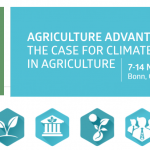 Since there was no decision on issues related to agriculture during COP22, member states and representatives from the G77 & China convened in Bangkok in March 2017 to discuss in detail the commonalities and differences between the positions of the G77 & China Group and the Group of Developed Countries, discuss what they learned from their involvement in the 45th session of SBSTA at COP22, common goal for the sector under UNFCCC, and what to achieve at the 46th SBSTA session. What does this mean for the ASEAN agriculture sector? 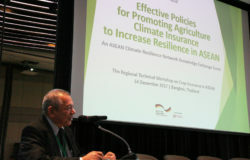 As a region and a sector that heavily relies on agriculture for food and livelihood, ASEAN is highly susceptible to the impacts of climate change such as extreme and erratic weather events. As a first and formal step for addressing climate change impacts and drivers in agriculture, the decision will finally allow for parties to the convention to: submit adaptation assessment methods for improving soil health, soil carbon and soil quality as well as considerations for improving nutrient use and manure management; and report on socio-economic and food security dimensions of climate change. 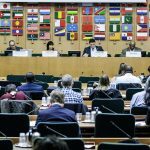 Likewise, it will require the parties to submit recommendations with regard to the implementation of outcomes from five workshops on issues related to agriculture from past negotiations. ASEAN-CRN is established to ensure that ASEAN member states are in a better position to adapt their agriculture sector to climate change and optimize its mitigation potential. ASEAN-CRN is being supported by the Forestry and Climate Change (FOR-CC) project under ASEAN-German Programme on Response to Climate Change, Agriculture and Forestry (GAP-CC), which is funded by the German Federal Ministry for Economic Cooperation and Development and implemented by Deutsche Gesellschaft für Internationale Zusammenarbeit in close cooperation with the ASEAN Secretariat (ASEC).